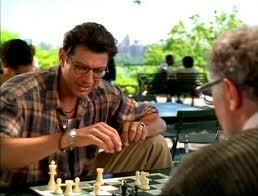 Its always a treat to see chess scenes while watching a good movie (at least for chesscrafters). 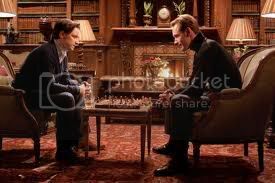 And so I hoarded some of the chess scenes from good (if not great) movies. 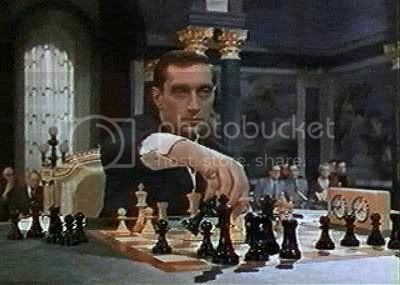 Here is another post movies about chess if ever you prefer to see movies in which chess is the star. Not so many teens of this generation have missed the romance between Bella a hot geeky babe and Edward, a mysterious hunk vampire, on this scene we see Edward playing the blood-red pieces. 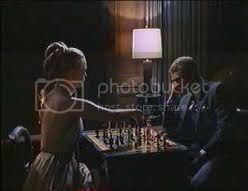 Austin is playing chess with Ivana Humpalot (hump-a-lot), and became sexually aroused, this scene is actually a spoof of a "The Thomas Crown Affair". The second highest worldwide gross of all time, with almost $900 million dollar, a great movie about aliens earth invasion, but thanks to Will Smith (a real-life chess enthusiast), luckily he's there to save the day. The chess scene was filmed in a New York park, but the most unforgettable scene was the alien's gigantic spaceship's laser blast of Washington D.C. The prequel of X-men shows how Charles Xavier and Erik Lenscher (Magneto) friendship turned to hostility, but it wasn't chess to blame. Erik's thirst for revenge to the ones responsible to the death of his mother, consumed him. Based from the book written by J.K Rowlings , tells about the adventures of Harry Potter in the wizardy school Hogwarts School of Witchcraft and Wizardry. 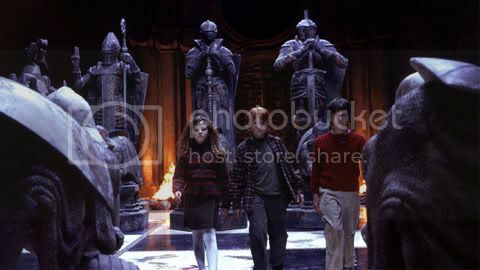 A giant Wizard's Chessboard was the third-to-last layer of security for the Philosopher's Stone. Harry played as one of the black bishops, Hermione as a rook, and Ron as a Knight. Using his extensive knowledge of chess, Ronald Weasley managed to get him, Harry, and Hermione Granger across, ultimately sacrificing himself to the White Queen so that Harry could checkmate the King. 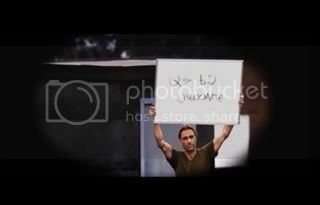 In George Romero's excellent remake of the zombie classic Dawn of the Dead, we see two characters, Andy (pictured) and Kenneth, on two rooftops playing correspondence chess with binoculars and cue cards. Why are they doing this? Well there are thousands of zombies between them and not a whole lot else to do. is a decent movie with fast-paced, smart dialogue and, coincidentally, Ben Kingsley who played the chess teacher Bruce Pandolfini in Searching for Bobby Fischer. He plays a jewish mobster here. But I digress. 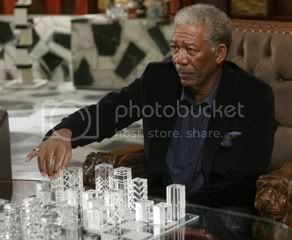 Morgan Freeman, aka "The Boss" (pictured) challenges Slevin (Josh Hartnett) to a game of chess as a chance to pay off a debt. Bruce Willis has a role and also plays against The Boss. We don't see too much, but it's still a nice nod. The movie revolves around Thomas Crown, A millionaire and sportsman trying to pull off a perfect crime, by robbing a money from a bank, on the course comes Vicki Anderson an independent insurance investigator who swear to retrieve the money. The chess game between Thomas and Vicki is intimate, adding the great musical score "The Chess Game". I have watched the movie many times. 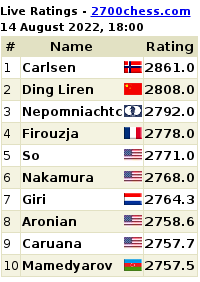 I like playing chess but can never win. Looks like I need to focus and learn some new techniques.